What do Dorothy Parker, Groucho Marx, H. L. Mencken, Oscar Wilde, Robert Benchley, George Bernard Shaw, Jules Feiffer, Bill Hicks, Bill Maher, Phyllis Diller, Édith Piaf, W. C. Fields, Mark Twain, Voltaire, Charles Bukowski, and countless others have in common? 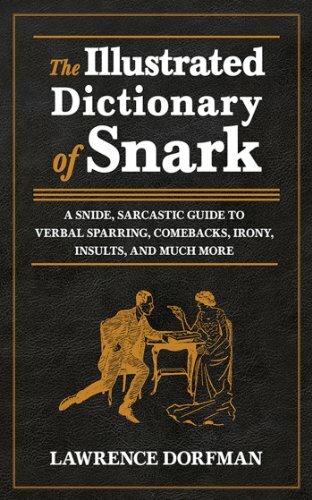 Not a thing, other than each was a brilliantly snarky wit and all are included in this compendium of the original snark handbooks. A minor literary success (beloved by both minors and miners), the snark handbooks have cemented their position in the literary world, high atop toilet seats everywhere. Now in one great big edition, this lofty tome promises to fulfill the need to chuckle, guffaw, titter, groan, and belly laugh as readers dip in and out of the great minds in literature, comedy, movies, music, and more. Proceed with caution.